High density baroceptor to precisely hold at an altitude. 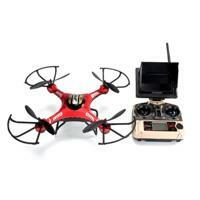 With FPV monitor,5.8G image transmittion allows you to see FPV images at real time. One Key to Start & Stop, One key to return function, makes it easily to find the way home. LED lights add visibility in the dark.